SS. Cyril & Methodius Church, Hartford, CT 5:15 p.m.
Welte Hall, Central Connecticut State University, New Britain, CT 4 p.m.
Welte Hall, Central Connecticut State University, New Britain, CT, 4 p.m. 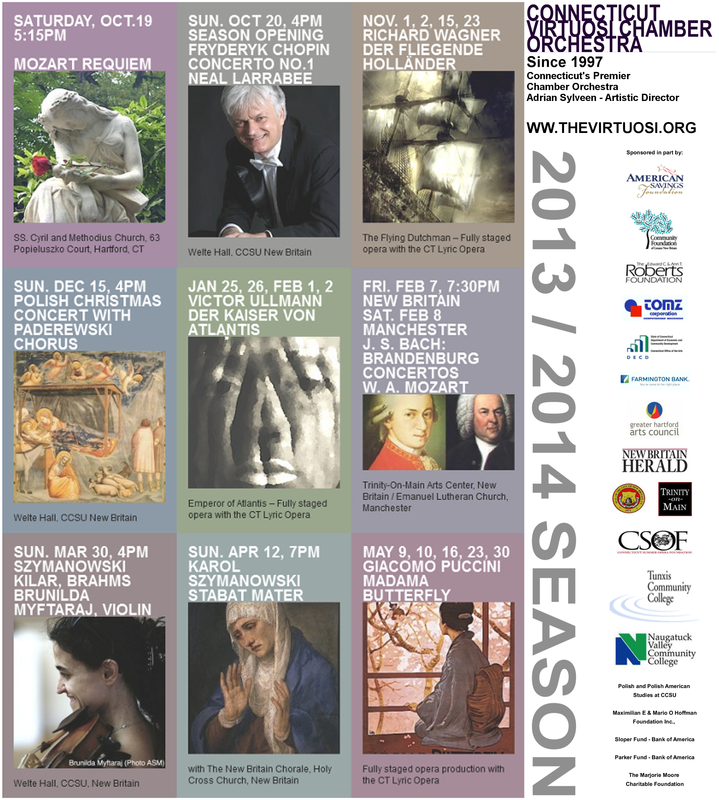 In the 2013-2014 season, the Connecticut Virtuosi Chamber Orchestra refocused its energy on the core mission of the organization and achieved significant artistic success and critical acclaim for an extraordinary season of over 40 public performances. These performances (including orchestral, opera, chamber music, and choral performances) reached a sizable and diverse audience throughout the state of Connecticut, including thousands of elementary to college-age students through the Virtuosi’s in-school presentations. The orchestra performed an exceptional repertoire of music by Karol Szymanowski, Viktor Ullmann, Richard Wagner, Puccini, Chopin, Moniuszko, Saint-Saens, Schubert, Mozart, Bach, and others, and featured internationally acclaimed soloists such as pianist Neal Larrabee, Brunilda Myftaraj (Virtuosi Concertmaster), extraordinary young soloists: Michelle Stern, violin, Alex Tiratsuyan, piano, and international opera stars Jurate Svadaite, Steve Fredericks, Daniel Juarez, to name just a few. Some highlights from the 2013-2014 performance season included the performance of Wagner’s The Flying Dutchman, which had its premiere in New Britain on Friday, November 1, 2013, and was later named Connecticut’s Opera Production of the Year by the New London Day. The Virtuosi presented only the third performance in the United States of Violin Concerto No. 2 by important Polish composer Karol Szymanowski (according to the publisher’s records), Virtuosi Concertmaster Brunilda Myftaraj was the exceptional soloist in that performance which also included the rarely performed Szymanowski Stabat Mater. The Virtuosi’s May 2014 opera presentation of Puccini’s Madama Butterfly was sold out in its premiere performance at Trinity-on-Main, as well as in Middletown, and was attended by more than 1,000 audience-members in New London and Waterbury. It was praised as “most satisfying, and at times deeply moving,” in a glowing review by classical music critic Milton Moore. The Virtuosi fulfilled the educational component of its mission by offering a range of educational programs to the community; including its series of in-school performances, the Virtuosi Youth Ensemble, the year-round Virtuosi Academy, and the Virtuosi Summer Institute and Festival. The 2013-2014 in-school performance series consisted of six performances in New Britain elementary schools (eight were originally scheduled, with two cancelled due to winter weather), two days of two opera presentations (total of 4) for Waterbury Arts Magnet School, and 2 open rehearsals at Tunxis College. These performances were well received by both students and teachers, leaving them inspired and encouraged to pursue music. Of particular note was the wonderful interaction in October between 9-year old violinist Michelle Stern and the Gaffney and Smalley elementary school students, who were impressed to meet a peer with such incredibly well-developed musical ability. Directed by the Virtuosi concertmaster, Brunilda Myftaraj, the Virtuosi Youth Ensemble started in October of 2013 through an open audition. The audition attracted students from Farmington, Bristol and New Britain. Weekly rehearsals of the Youth Ensemble were free, and the fee for one-on-one lessons for students from New Britain school system was reduced by approximately 50%. In May 2014 the Youth Ensemble gave a second performance with members of the Virtuosi Chamber Orchestra at SS. Cyril and Methodius Church. The combined orchestra presented the famous “Clock” Symphony by Joseph Haydn. Fragments of the recorded performance are available at the School’s website. During the last year we have learned valuable lessons regarding the youth orchestra/ensemble. The program will continue next season as a regional group available to communities of Central CT. While we will make an effort to publicize the program with the New Britain Schools, the program will be independent from any school system and will be continue to be presented at Tunxis community college. The Virtuosi has hired Mr. Matthew Burry for the position of the Executive Director. It his position Mr. Burry is responsible for maintaining the financial stability of the of the Virtuosi. In his first year he brought 2 new grants to the Virtuosi, and spent his first year learning the structure of operation and funding of the Virtuosi.